The theropod dinosaurs, like Tyrannosaurus rex and Velociraptor, were some of the most fearsome carnivores ever. Yet most of these perfect hunters abandoned live prey in favor of a more peaceful, vegetarian existence...which started their evolution into birds. Researchers recently set out to determine the diet of 90 different theropod species. They were expecting to find a lot of meat-eating - after all, theropods are known informally as the predatory dinosaurs. 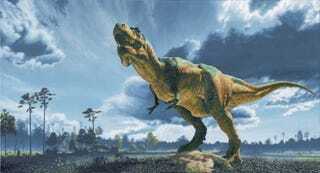 But even confirming that hypothesis would be tricky because so little evidence of dinosaur diet remains. Teeth do often pass into the fossil record, but it's not always easy to figure out diet based on just teeth. While the sharp teeth and jaw of a T. rex is obviously that of a fearsome superpredator and the blunt teeth of a Triceratops obviously belong to a plant eater, a lot of dinosaur teeth fall somewhere in the middle. A lot of therapod dinosaurs have strange, peg-like teeth which seem less than ideal for either a carnivorous or herbivorous existence, so figuring out what they ate becomes a real challenge. The good news is that there are lots of other types of evidence: fossilized poop, preserved stomach contents, marks on the teeth, and even stones inside the stomach that would have been used to digest vegetation all provide clues to dinosaur diet. The researchers used statistical analysis to figure out which of these bits of evidence were most strongly correlated with eating meat or eating plants, and then look for other dinosaurs that also possessed those features. "Most theropods are clearly adapted to a predatory lifestyle, but somewhere on the line to birds, predatory dinosaurs went soft. "This is a clear-cut indication that the repeated evolution of a toothless beak in theropod dinosaurs is linked to plant eating. Once a beak appeared on the scene, it continued to evolve. Theropods would have used their beaks in a myriad of ways; they still do." So why did the perfect hunters of the dinosaur world switch to vegetarianism? It might have been caused by the breakup of continents, which opened up new and unusual habitats for these dinosaurs to explore. However it happened, the theropods - particularly the coelurosaur subgroup, which included T. rex and Velociraptor - became one of the most diverse and successful dinosaur groups of the Cretaceous Period. Maybe it really is worth eating your vegetables after all.